Take a look at the Twilight Saga Soundtrack CDs available on Amazon.co.uk and relive the music from the movies. 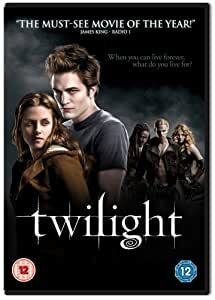 Twilight, based on the acclaimed novel by Stephenie Meyer, is the highly-anticipated movie of the ultimate forbidden love affair between a vampire and mortal. Boasting a whole host of bright young talent including Robert Pattinson (Harry Potter and the Goblet of Fire), Kristen Stewart (Into The Wild, What Just Happened) and Cam Gigandet (Never Back Down, The O.C. ), the screenplay is written by Melissa Rosenberg (Step Up, The O.C.) and directed by the award-winning filmmaker Catherine Hardwicke (Lords of Dogtown, Thirteen). Bella Swan (Kristen Stewart) has always been a little bit different, never caring about fitting in with the trendy girls at her Phoenix high school. When her mother remarries and sends Bella to live with her father in the rainy little town of Forks, Washington, she doesn’t expect much of anything to change. Then she meets the mysterious and dazzlingly beautiful Edward Cullen (Robert Pattinson), a boy unlike any she’s ever met. Intelligent and witty, he sees straight into her soul. Soon, Bella and Edward are swept up in a passionate and decidedly unorthodox romance. Edward can run faster than a mountain lion, he can stop a moving car with his bare hands--and he hasn’t aged since 1918. Like all vampires, he’s immortal. But he doesn’t have fangs, and he doesn’t drink human blood, as Edward and his family are unique among vampires in their lifestyle choice. To Edward, Bella is that thing he has waited 90 years for--a soul mate. But the closer they get, the more Edward must struggle to resist the primal pull of her scent, which could send him into an uncontrollable frenzy. But what will they do when Laurent (Edi Gathegi) and James (Cam Gigandet), the Cullens’ mortal vampire enemies, come to town, looking for Bella? Subtitles are in English for the deaf and hard of hearing, only. What can I say about Twilight? I've never bothered much to read the books,or watch the movies for that matter, but I saw girls/women around me in awe about this. Edward this, Edward that, Robert Pattinson here and there. So after watching Vampire Diaries I got curious and started watching Twilight. Within 20 minutes I was hooked. Can't let go anymore, ordered the books, ordered all the movies there are and following everything now very closely. Feel a little embarrassed because I'm a 35 y/o woman that is totally hooked on the characters (book as wel as the people portraying them on screen) and keep rewatching over and over and over again. I actually feel a bit empty inside when I'm done watching, so I start from the beginning again haha! I love the story, the special effects in the movie, it's just such a great big love. You shouldn't overthink it all too much. I know people are saying well how stupid is that, she has to die in order to be with him, he is too protective and overbearing. But don't look at that. Look at why she wants to become a vampire and why he acts around her the way he does. It's their love. And that love is amazing and I would wish for everybody in the world. I only came across the Twilight Saga recently, and have enjoyed all the films. I am not a teen by a long way, but find these very worth watching, and keeping to watch again in future. Teen light horror is enjoyable because it has a magical fantasy edge to it without the extreme gore and violence you get in vampire/werewolf films aimed at an older audience. This is the story of Bella Swan. She used to live in Phoenix with her mum and her stepfather, but decided to move in a small town in Washington called Forks to try to live with her father for a bit. Bella, 17, feels different from the other students, and this is noticeable even by just looking at her features: Extremely pale and beautiful in a different way than other girls. At her school, a family called the Cullens are different. They are all extremely pale and beautiful. They are adopted by the beautiful blond doctor in town and his wife. The family consists of Dr.Carlisle Cullen and Esme, Rosalie and Emmett, Jasper and Alice, and finally the mysterious Edward. Bella and Edward are attracted to each other straight away. The film is very nice, but I have to say that the 4 books from Stephanie Meyer are amazing. Bella senses that Edward is different from her, because of his eye colour changing to gold and black, his speed and strength. She then researches and learns that he is a vampire, as well as his family. He warns her to stay away from him, but they can't. Edward and his family are different than others because they don't feed on human blood, but hunt animals instead. They don't want to be "monsters". However, there are other vampires who are just killers, or more precisely: "trackers". Edward and Alice have a power. He can read people thoughts (except Bella's), and Alice has visions of the future. They can go out during the day, but prefer bad weather, because when it's sunny their skin glows like diamonds and everyone would notice that they don't look natural, hence not human. Bella is not scared because she knows that Edward would never hurt her as well as his family. For Edward it's hard to be too close to Bella, such as kissing her for example, because she's like "his own personal brand of heroin" as he says. It's hard for him, because he would like to drink her blood, but at the same time he loves her. At the end of the film, Bella is still with Edward and would like to be an immortal as well so that they could be 17 and together forever. He asks her if one lifetime is not enough for her, and she replies that for the moment she can live with that. The film explores sexual tension for teenagers very well. It's also a very modern film about friendly vampires as we haven't seen since a long time. Maybe a bit in "Interview with a vampire", or in Buffy, but it's still very different. I recommend it, but if you can, read the 4 books first even if they seem huge, they are amazing and you will read them very quickly as they are extremely entertaining. I LOVE the book series and at first I found this film a little disappointing - but I watched it about five times with an open mind and tried not to think of the book and began to enjoy it. The deep love and fascination between Bella and Edward is vague and you have to guess how she's feeling and Edward (Robert Pattinson - may he find his way to my pillow as a vampire!) isn't really dangerous enough. If it's true that he was toned down against his wishes - BIG mistake! I think the fault lies with the screenwriting (did any of the production/directing team actually read the book?) - I totally agree with the other reviewers' comments in this area. Kristen Stewart can be irritating when she shows so little emotion, she obviously needs to learn how to open her mouth when she speaks and Edward shins up the most amazing trees with Bella on his back - obviously totally forgetting that she is supposed to be not only accident prone but really scared of the great outdoors! A little more attention to developing the strange obsessesional love story might have helped. The actors are well chosen (Kristen Stewart is exactly as I imagined Bella) - although I'm not too sure about the Carlisle choice - and its just a shame that the screenplay wasn't better. Pity because its a brilliant story - but I shall look out for the other films as I am now hooked on the Twilight series. Hopefully the screenwriting will improve. As I say don't expect too much - watch the dvd as something removed from the book - if you've already read it - and you'll enjoy it.